Easy to make and lots of fun for children to decorate. 1. Preheat the oven to 170°C, gas mark 3. Line 3 or 4 baking trays with baking parchment. Melt the butter, sugar and golden syrup in a medium saucepan, stirring occasionally, until melted, then remove from the heat and set aside. 2. Sieve the flour, bicarbonate of soda and ginger into a bowl. Stir in the melted ingredients to make a stiff dough. 3. Turn out onto a lightly floured surface and roll to a 5mm thickness. 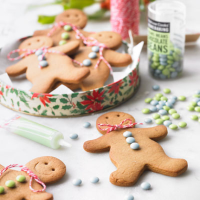 Using gingerbread men cutters, dip into some extra flour before cutting out shapes. Place onto the lined trays and, using a skewer/knife, make two holes for eyes and draw a mouth. Bake, in batches, for 9-10 minutes until light golden brown. 4. Leave to cool on a wire rack. If desired, use the icing to stick on beans, then attach string for bows. Store the biscuits in an airtight container for up to two weeks.